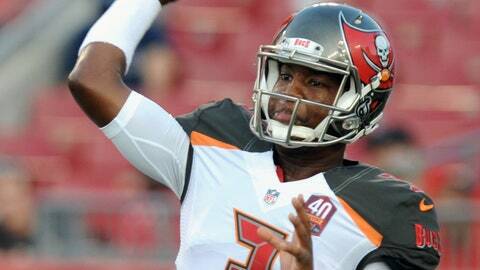 Jameis Winston's first NFL pass went the wrong way for a touchdown. Quarterbacks Jameis Winston of the Tampa Bay Buccaneers and Marcus Mariota of the Tennessee Titans, the first two picks of the 2015 NFL Draft, squared off Sunday in Week 1, and one of them got off to a far better start than the other. After Mariota threw a 52-yard touchdown pass to wide receiver Kendall Wright, all eyes shifted to Winston, the No. 1 overall pick. From there, well, things didn’t go very well. That was Winston’s first career pass attempt, by the way. Mariota with a 52-yard touchdown, Winston with a pick-six. Both will have definitive memories of how their NFL careers started out. It didn’t get much better for Winston the rest of the way. He finished 16 of 33 for 210 yards, two touchdowns and two interceptions in Tampa Bay’s 42-14 loss. Mariota went 13 of 16 for 209 yards, four touchdowns and no interceptions.